(EN) Gentrification is arriving at a more leisurely pace than in its immediate neighbor to the south, Williamsburg; Greenpoint’s creative class incursion being subtle, almost assimilative, as compared to their Jean Paul Belmondo-idolizing ‘hipster’ counterparts in W’burg. It is here that Gary Hustwit keeps his studio, in a relatively nondescript converted pencil factory. Walking into the studio is an intimidating enterprise for the design nerd. Leavened shadows of his interviews with everyone from Frank Gehry to Sir Jonny Ive to Massimo Vignelli permeate, while you try to forget that this is the dude who made fonts a household concept, and, realistically, did as much to forward the great collective design enlightenment as IKEA did. Assembled design paraphernalia gives a glimpse into the wide range of Gary’s output and interests. A Helvetica emblazoned birch skateboard (presented to him by the American Institute of Graphic Arts) sits alongside original Dieter Rams-designed Braun stereophonic equipment, obscure arthouse DVDs, a prodigious design library, handmade guitars from Koll (a small guitar manufacturer in which he is a partner) and so forth. This portrait is part of our ongoing collaboration with ZEIT Online. Head over to ZEIT Magazin Online to see more images and further insights on Gary. (EN) Gary is a true icon in the worlds of design and documentary cinema. An omnivorous autodidact. It’s hard to overestimate the impact of his seminal design doc trilogy—Helvetica, Objectified, and Urbanized. For many, these films sparked a lightbulb moment, revealing the overwhelming impact design has on our day-to-day lives. Your sister’s Dwell subscription. Your mom’s Pinterest page. Hustwit is one of the people responsible for this broader awareness of, and appreciation of, design itself. Art shapes our lives in ways that defy causal explanation. And architecture and design is, of late, widely understood to be the axis of art, science, and sociology. The place where the creatives genuinely impact the diurnal. You don’t have to have studied De Stijl to covet a Rietveld chair, nor do you need to know how you wound up in a world where you want one. Or are even aware that it ever existed. Corbusier furniture arises in suburban redecoration chats; people genuinely debate both the functional and aesthetic properties of things before they buy them. (EN) Plexifilm re-released seminal arthouse pictures including Finisterre and Style Wars, as well as several music documentaries. This led to them working as a sort of ‘production company for hire’ on several music docs, beginning with the Wilco documentary, I’m Trying To Break Your Heart. “I didn’t really intend to become a filmmaker; it was just a movie that I wanted to watch.” This punk-rock, DIY instinct is at the heart of everything Hustwit does. The founding of Plexifilm, making the leap to documentary filmmaker, the creation and ultimate publication of The Olympic City (a collaborative still photography book investigating the state of post-Olympic architecture). This same spirit is embodied in his latest project: a feature-length documentary on the legendary German designer Dieter Rams, whose defining principle, As Little Design As Possible, has become the watchword for proto-minimalists the world over. An oversubscribed Kickstarter campaign has funded not only the film, but the preservation of Rams’ design archive, assisting with cataloguing and digitizing of a veritable treasure trove of material. Hustwit is justifiably known for his films, but he’s a difficult man to pin down; a sort of culture-polyglot. Rather than limit himself to the title of documentary filmmaker, he’s involved in a host of projects. The Olympic City Project, the guitar company he co-founded, the Virtual Reality documentary film collective he co-established. But over the course of our conversation, as wide-ranging as it was, a single anecdote stood out, and seemed emblematic of the influence that his output has had. While walking down the street (in Manhattan’s Lower East Side), two guys were overheard debating a restaurant, and one says to the other ‘I’m not eating there, their logo is in Papyrus’. 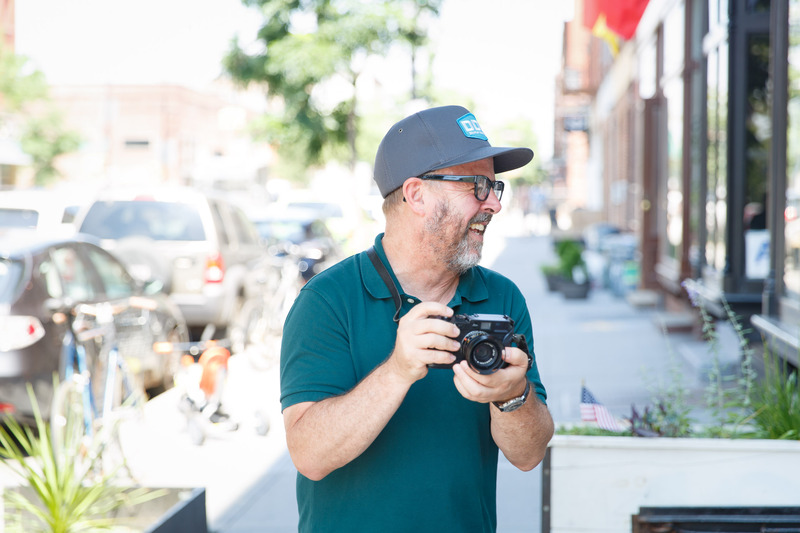 (EN) Thanks Gary for showing us your studio in Greenpoint and sharing your incredible work with us. For more information on the upcoming documentary film on Dieter Rams, see here.